The first land art piece Andrew Rogers created was a monumental Chai in Israel's Arava Desert in 1999. The Hebrew symbol represents a toast -- To Life! 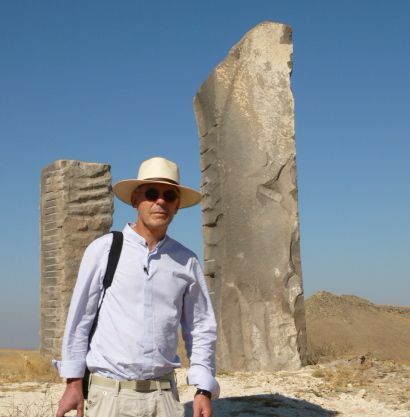 -- and in the twelve years since, Rogers has certainly been living the life, as he travels the seven continents drawing on the earth, erecting giant sculptures that express his thoughts on time, destiny, connection, spirituality, synchronicity and, of course, the spirit of life itself. "Listen to the silence of the land," Rogers, who lives in Melbourne, Australia, tells us, as he gazes out into the distance, Crocodile Dundee hat shading his boyish face. We have climbed a hill in Cappadocia, the remote region in central Turkey known for its strange, phallic rock formations and are sitting in an amphitheater Rogers's crew has carved into the dry, rocky earth. It is indeed silent, and still, in the hot sun of the afternoon, and below us and around us we can glimpse several of the sculptures Rogers has created as part of his Rhythms of Life global land art project. 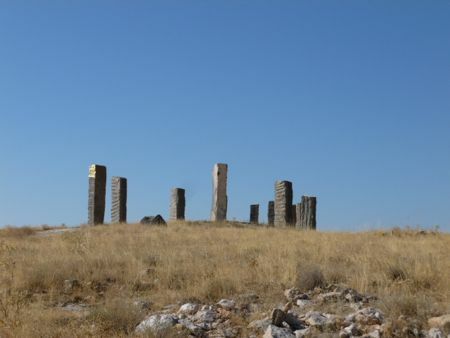 At the Turkey site there are thirteen colossal sculptures - several are modern and stark and composed of columns, sometimes partly covered with gold leaf. 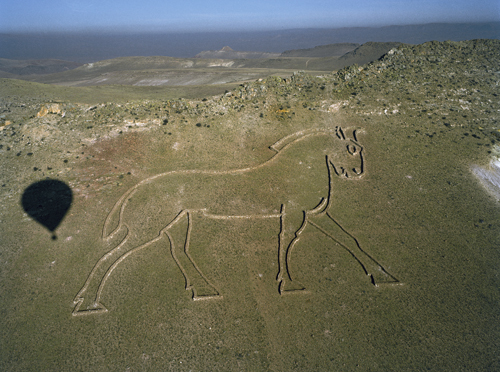 Others, which he calls geoglyphs, are place-specific cultural symbols inscribed on the earth using stonewalls of various heights and thickness (like the Chai in Israel or a Cappadocian horse in Turkey.) All have been created from local stone and rock. 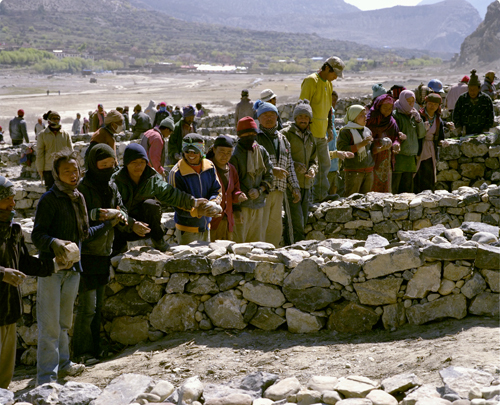 Each project -- whether in Iceland, Antarctica, Peru or India -- is a collaboration with the local community; often several hundred men and women are hired for at least twice the going labor rate to collect and place the rocks in specific patterns that have been determined by Rogers using a GPS and mapped out on the earth with stakes and string. Over 5000 people have worked on this project so far. Not only do the local communities do the actual labor, they also help Rogers determine the symbols that will be incorporated into the individual earthworks. Elders from the community bless the land before the project begins and a huge celebratory bash marks its completion. This might include sacrificing a llama, as was the case in Boliva, or a wild fireworks display in China, where Rogers' "assistants" were the army troops. The works are meant to be viewed two ways. On the ground, one slowly moves around and through the sculptures, gradually taking in their gravitas, their earthiness, their texture, their complexity yet simplicity, but without being able to make out their actual design. From above, as we did that morning from a hot-air balloon, one can take in the totality of each individual piece, distinguish the shadows of light created by the columns, for example, see the relation of one piece to the others, yet, from above, one cannot feel the heft of the stone the way one does up close. To achieve this perspective, sometimes Rogers constructs a viewing platform, or, as in Turkey, an amphitheater that allows viewers a vantage point from which they can contemplate, if not the entirety of a project, than at least more than they can see from the ground. Sitting in the amphitheater recently, someone asked how Rogers felt about passersby mistaking his sculptures -- which are never marked by signage -- for truly ancient symbols and objects. He doesn't seem to mind. "I like to take people into the domain of speculation and out of the ordinary," he says. He also does nothing to maintain the earthworks when completed. The roads built at the sites to facilitate the transportation of materials are eventually covered by weeds, and though grazing animals may keep the surrounding grasses trimmed, the sculptures might also become overgrown and neglected. Rogers believes they will all disappear eventually. Maybe because he came to art late in life -- he studied economics in college and had a successful business career before turning to sculpture full-time - Rogers has an overwhelming enthusiasm for his project, a joie de vivre that comes from doing what one is meant to be doing. 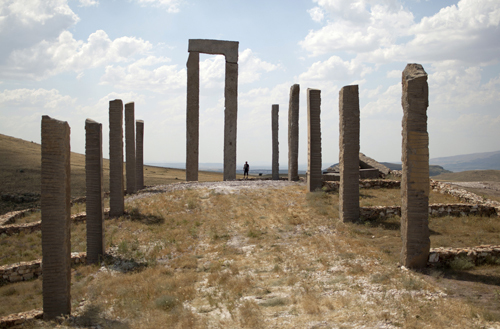 Here in Turkey, he bounds up and down the hills from sculpture to sculpture, a big smile plastered across face. "I'm so happy to be here again," he says. One can easily picture Rogers happily directing hundreds of local assistants in Namibia or Patagonia, his next destinations. As long as there are valley and deserts to serve as his palate -- or until the rhythms of life send him reeling in another direction -- Rogers will continue sculpting on the earth.